The BB Preamp offers awide variety of sounds. It's capable of a 30dB+ clean boost with an adjustable ±15dB two band active EQ which adds a wide range of harmonic content to your ideal sound. The BB also utilizes a pre-gain stage which allows the Pedal to go from a very pristine clean to a very smooth,compressed, overdriven sound. does anyone know what changes have to be made to turn it into the bass version? (i.e the bass BB preamp?). i wonder if he uses a larger cap on the input too? It's not going to cause any harm, and would make sense for any effect intended for bass to bump up the input cap so you know that no low frequencies are going to be lost right at the start. The 47n at the lower IC pin 2 could also do with increasing. That and the 4K7 resistor following is a high pass filter and those values would give a frequency of 720hz which would obviously mean that lots of bass would be rolled off from there down at 6dB per octave. But I'm not entirely sure how it affects the filter when the connection is made to vbias instead of ground. So I wouldn't like to guess a good value to try but I'd definitely suggest socketing that 47n and pushing it up a few levels. thanks. yep, you're right. i read somewhere that he said it was kind of xotic's version of a tubescreamer for bass, and the mods to make a TS suitable for bass requires a cap change in that part of the circuit. to get it to go down to 34hz, you increase that cap to a 1u, and it is supposed to be connected to the vbias when you do it. i built this one this evening but it's not working properly yet. i'm pretty certain that i built it exactly as shown but it barely has any level, the distortion doesn't work, and when you turn the treble down, it shuts off( shorting out?). i've been looking for the schematic online but i haven't been able to locate it yet. the voltages on the chips don't seem quite right to me either. Yes definitely left a cut in that shouldn't have been there, if the cut to the left of the top of the 470K is removed then it connects to the jumper which connects to vb. I'll check over the rest of the layout later. i think that the cut under the 33K resistor shouldn't be there so the 470K resistor will connect to the VB supply. it still didn't solve the problems but it's getting there. Yes that's the same schematic I used to do it from. I've been over it again and everything else appears to be ok (after removing that cut). In the power section the only thing I changed was to exclude the 1N4004 as I usually do when they're placed between supply and ground to avoid blowing a chunk out of the board. Apart from that we have a 10K to vb at the top right, 10K to ground at the mid left along with a 10u vb filter cap, and the main ps filter cap bottom left. Do you have an audio probe so you can see where the problem starts? Or even the transistor and opamp voltages may give us a pointer. yeah i figured you'd remove the diode (no big deal). i'd actually prefer to make it like the original with the 4558 and TL072 but that would mean that you'd have to redraw it completely. i've been going over the vero for the last hour or so and it looks right to me too........but it still doesn't work. ;-( there's no distortion, level and the tone controls work but very faintly. i have a scope and a probe, so if i have time later today, i'll start going over it. when truning the pots, it sounds like it's getting DC into the signal somewhere. i'll post my voltages too. Maybe a dodgy opamp? Why would I need to redo it for you to use a 4558 and TL072? They have the same pinouts. i don't think i have a bad opamp since i tried several of them in it with the same results. Aah right. With it being you I'm pretty confident it'll be built right, so I'll go over it a bit more carefully and triple check all the connections I've shown. Oooops, I've got the diode switch going to Drive 2 and 3 instead of Drive 1. See if that change helps. i just tried that and still doesn't work. it does some strange oscillating if i turn the pots in certain ways. i've looked over my PCB countless times but i may just have to try and start over again. i might even take a stab at drawing a vero up of it myself, but there's no way i cvan make it as small as you do. because the first one is for the clipping circuit and the second one is for the eq and output buffer. the way that you have it laid out you can't split the fet (TL072) in halves. Aah right, I see what you mean. I used the channels in the way that made the layout flow better and spread the components more evenly on the board. I didn't even consider using different opamps in there when I was doing it. That's weird, from the top IC pin 1 output you've measured 4.55V. That then goes through a 100n cap and 10K resistor to the inverting input, pin 6. But there it measures 5.969V? So it's gained 1.5V ish somehow, despite the fact that the only other thing pin 6 connects to is pin 7 via a cap and resistor, but pin 7 only measures 4.656V. Something doesn't look right to me around there. Check the soldering and for any small burrs or something in the cuts under the IC. Q1 base voltage also looks high to me, the 470K attaches to vbias but it shouldn't be anywhere close to 4.1V. If you can't spot anything iffy around there then I think it needs probing, so you can follow the scheme and see exactly where the problem starts. I FOUND IT! evidentally i had one cut that wasn't a completely full cut horizontally on the Bass 3 / IC2 pin 8 line. DOH! after fixing that, bridging the extra cut under the 33K resistor (which has been updated & omitted), and corrected the diode switch wire (also already updated) it works perfect now so you can tag it. thanks Mark. I'm going to try two TL072's in now and possibly replace the dual 4148's setting with two LEDs. just tried two TL072's and i think that i like two JRC4558D's (or DD's) in this one. i'm also going to just use a two way DPDT clipping switch to go from two and four diodes since the dirt without any diodes is pretty harsh & bright. for bass, the 4n7's in the treble circuit sound just as good as the 6n8's so i'll probably just stay with the 4n7's, but the 1U instead of the .047 really gives the pedal some HUGE low end. me too! ;-) . i was kinda surprised to have a bridged cut since i've built more than 50 of your vero's without ever having that problem (i use a dremel with a tiny bit to make my cuts) it's a great compact layout, and there's no way i could get it to be that small. boxed and labeled it tonight. this baby's done and sounds great. i'm running two JRC4580's in it now. Looks excellent, I'm glad this one will fit in a 1590B, I hate it when the layouts mean you have to use a larger box than the original. John, where do you source your electrolitic caps ? I can see on your pics they are very low profile which is great for easy boxing ! i get most of my components from mouser (they have the biggest selection and give the part dimensions). john what did you use in labeling your bb clone? He's using a Brother P-Touch label printer, plenty of info about that over in the forum section. So Mark did you need to update the layout after John's feedback ? I already populated the board with the "original layout" and am currently waiting for pots to finish it, should I change something ? The layout has been updated. The only differences are that the cut at the top of the 470K from Q2 base has been removed, so if you've already placed that cut you'll have to make a little bridge over it. And the switch attaches to Drive 1 instead of Drive 2 and 3. Basically the layout as shown above is correct. Yes it was one I put in in case I needed the row further down but as you say it wasn't required, so I removed it from the updated layout. I just finished building it without the clipping options, it really sounds great, but maybe a bit too much on the bright side (I mainly play single coils). Which cap should I tweek ? There's a high pass filter on the input of the first opamp which cuts a lot of bass, try increasing the 220n cap or the 220R resistor. You could also increase the two 4n7 caps at Treble 1 and 3. Maybe socket those positions so you can experiment to make it perfect for you. I'll try this, thanks again for your fast answer ! built it but having problems. Used a DPDT on-on switch. The side with 2 diodes is sounding fine but the other side is not ok, the notes are dying immediately after being played. What could be causing it? the diodes on the switch are soldered properly checked it, somewhere something in the circuit is not ok, which portions to check? Are there two leads coming off drive 1 - one that goes to the board and the other that goes to the switch? Or are you supposed to go from drive 1 to the switch and from the switch to the board? Still having a helluva time trying to keep the leads short when doing these vero layouts and having to come in on the top of the board with the wires. On this build I put all the wires on the board and placed the pots on the outside of the enclosure and that seemed to make things a little easier, though, with the amount of wire between the board and the pots, I'm concerned that the wire is going to get in the way when I put the guts in the enclosure and try and close it. Still looking for any tips on making wiring easier while keeping leads as short as possible. John, your build looks pretty neat. How do you go about wiring your components? Got a Paisley drive under way as well. As always, thanks for making this stuff available! It doesn't matter, you can do it any way as long as all 3 are connected together. It would probably be easier to have a single wire to the board, a single wire to the pot, and both other ends joining at the switch where you can wrap them round the solder lug to make it easier to make the daisy chain. To keep the leads shorter you could mount the board upside down - track side up, that does make things easier IMO. Once soldered turn the pots so the wires are twisted together which helps to keep things together. This won't of course keep the leads shorter but it keeps things neater and stops jumbled messes which can happen with some builds. Quite interested in this one. I like the sound from the you-tube video's. Not to big on any gain pedal that only has "tone" control. Like being able to control the treble and bass. Before i build one, has anyone tried 18 Volts through it? I built this! It worked first time, VERY lovely effect. My first build on stripboard, so i was expecting some trouble, but it just turns on and does it's thing! I use the 4*diode solution exclusively. I find the 2*diode optoion sounding too dull, so i will skip the switch and just wire the 4*diodes permanently. Thanks for a lovely website! does anyone assemble bas version of this pedal? i've just finished mine. what a lovely sound! However, when the dpdt switch is in the middle (no diodes) the volume is louder than in the diodes positions (either two or four diodes). What can I do to attenuate that, please? That's exactly what you would expect in the middle position. The diodes clip the signal and make it quieter (albeit with more distortion) so when you lift the diodes you should get a jump in volume. People tend to use that position as a clean boost when they want volume more than break-up. finally it's more an advantage than an inconvenient! Thanks a lot, your layouts are a blessing for those who wants to expand their guitar sound! it would be awesome to have a layout for the Xotic SP Compressor which is very versatile, with a very good sound. Nevertheless, I know it's hard to find the time to edit all the layouts in this blog, and I thank you in advance for any contribution you post for our eers and ours guitars...! Hello fellow builders, completed this build and had the same strange oscilating noise. Couln't get anything out of it. Until I put a n4001 between the 9V ande ground. Then the problem was solved. Everything works as it's supposed to, good sound. Only when the diode clipping is engaged I have to turn the volume to the max to get unity. When the switch is in the middle there is no problem, the it serves as a good booster. Has anybody else this experience or found a solution? Mount the board facing down, you should then be able to get the switch height accommodated easily, just make sure you put a bit of insulation tape over the contacts if it looks as though you could short something out. Do you tend to fasten the board with hot glue or something when mounting it upside down? I´ve used to just use dual-sided tape to stick the board to the back of the pots and it has worked ok, but possibly not when the board is upside down...? I just cut the lugs on the switch shorter and place the board over it. I thought about it too, but thought that it would still not be short enough. Maybe it´s just the Tayda-switches I use... Where do you get yours? It looks different. Already built one with the switch, but I think I want to leave the switch out and just use the two-diode setting (most common in the orginal? Also, the middle-setting has pretty ugly decay). What would be the neatest way to put the diodes to the board? I've seen two schematics for BB. The other doesn't have a value for that resistor at all, but it is definitely a 47k in Madbean's Glitterattii. I just recently build one, and it did oscillate unboxed. So i just swapped the clipping amp's 51p for 220p. That did the trick for me. Which schematic are you referring to? I just replaced the 47k for 33k on my build. In addition to having 220p in the clipping amp FB loop. Better. Still enough output to shatter glass, but i can't get it to oscillate in any settings. any idea to use this layout for the bass version? I'd like to realize the bass version of this pedal...what kind of mods should i've to do? +1 for laying out the bass version. I will build it immediately. Not sure how much the guitar and bas version differ, but for starters you can up the input and output caps to let more bass in and out. Also, johnk built one for bass and mentioned chaninging one of the 4.7nF to 1uF to get more bottom end. Check up towards the top for his post. Can i use a 150pf cap instead of a 151pf? Hi all, just a beginner question. There is a 1µ F capacitor in this schematic. Does it need to be absolutely not polarized ? Thanks ! short answer is no. if the cap is not marked as being polarized, then you can use any cap that has a value of 1uF. But, if that cap is marked as being polarized depending on the placement of the cap, you may be able to sub a non-polarized cap for a polarized cap. You can usually do this if the cap is in the signal path, and not going to ground. You can also substitute a polarized cap for a non polarized cap, but you have to make sure you have the polarity right otherwise the cap will explode. While it's fun to see, not fun to experience first hand. absolutely? i'm not sure. but you can always try a polarized cap both ways and see what happens...that's what i would do...!!!... (but remember that i'm not responsible if you burn something!!!). if you don't have a non polarized 1uf, you can also connect in parallel 2x470nf or whatever you got to reach that 1uf. hi all ... a question .... the veroboard which is published as is with all corrections ???? and if not corrected please send me the corrected image veroboard .. I'm looking to make this for bass, and i see some suggested changes listed above. The way it's all written gets a little foggy for me. Could anyone just list the changes that need to be made? What schematic did you use in this layout? It sounds better than my suhr riot build, which the sound is a bit loose, dull and cuts out a lot of high end frequency. For this one,I get a high pitched noise when I turn up the treble and bass... which cap or caps can I change in order to elimilate it? also, the B1M "gain" doesn't seem to make obvious difference in terms of distortion. my problem? There is already a comment here about the behaviour you're experiencing. 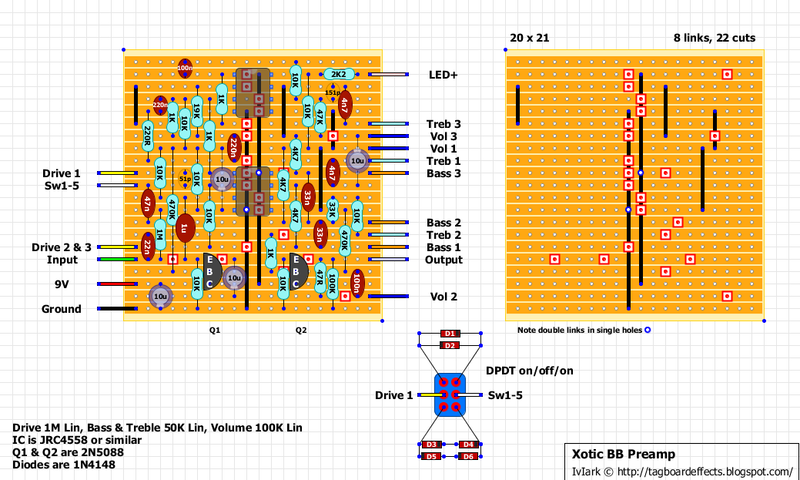 The layout is per the schematic that was up in german DIY forum and thus, there is a slight error. The upper right side. There is a 47K resistor. Lower that value to something like 18K, 22K or 27K. As stated, that resistor is 16K in Madbean's documents for his version. 47K takes out too much gain for that opamp half, which causest that part of the circuit to oscillate. You could also up the 151p for 200-220pF. thank ou so much again, I will do what you said. keep learning! cheers! Mr Mirosol, if you don't mind, could you please help me out on my suhr build please? Hi There, Just a bit confused by the LED+ wire from the board. Does that mean there are 2 connections at the LED+ when using the Offboard wiring diagram shown on this site? Sorry, to clarify....Does that mean there are 2 connections at the physical LED+ ? No. You can use a connection to led+ from the board if convenient or just wire per off board. I'm also a little confused from the threads above w.r.t. changing the ceramic cap value in the clipping amp. There is reference to the 51p and also the 151p. i.e. swapping for a ~ 220p. Are you able to point out the cliipping amp and which of those 2 values should be increased to 220p please? I've built three of these and one of the three does the squealing with the treble and gain maxed...the 51p is the one you want to increase (or at least the one I've increased) to eliminate that squeal. The clipping amp is the IC more central to the layout...the one where pin 1 is in the row connected to the Drive 1 pot lug. The ceramic cap in question is in that row as well. I've increased it to about 94p (running two 47p in parallel) and that seemed to do it for me. My concern, however, is the change in the rolloff frequency created by that capacitor in particular. If my calculations are correct using the formula found here (http://www.electrosmash.com/tube-screamer-analysis) for a tubescreamer (the BB is essentially a tubescreamer followed by a good active two band eq), I find that with the gain maxed and the 51p being used, the rolloff frequency for the clipped waveform to be just a tad higher than 3K (the original tubescreamer with the smaller value pot and higher value resistor have it at around 5.6k). Increasing that 51p decreases the rolloff frequency of the low pass filter. Changing it to 94p decreases the frequency to 1.6K and changing it to a 220p creates a rolloff frequency of about 700hz. I'm curious as to whether or not most people can hear that change of if I've got my math all wrong and don't know what the heck I'm saying 'cause I don't quite understand the analysis of it all (quite possible). Have you tried this thing called the internet? I build it for bass, so i did some mod for adjustment. Replace 22n cap to 220n on input section. Remove 33n (2 caps) on bass control and replacing with 100n. Then remove 4n7 (2 caps) on treble and replacing with 10n. It works well, but there's any mod to increase gain? any advice? The BB Preamp has alredy the "more gain mod". Remember it's similar enough to a Tube Screamer. The only thing you could try is change the 4.7k resistor (R6), the one to the right of the lower IC. Reducing it to 2.4k or 1k you should increase the gain, but even change the clipping frequency, maybe you should increase a bit the 47nF (C4) next to the "Sw1-5" wire, too. Then, I'm not sure, but maybe you could try to increase 1k resistor R11 and 47k R16. I expect that increase the gain, but I could wrong. And the last thing I think is to increase the gain of the input stage, maybe using and high hfe transistor (MPSA18?) or change some resistor value (R3?). Would it be a good idea to use LEDs as clipping?